Pontiac’s F body Firebird is a fantastic name for a vehicle and conjures up plenty of imagery of a firebreathing car with the power to boot. Therefore, when you see a Firbird actually spitting flames it’s a sight to behold. 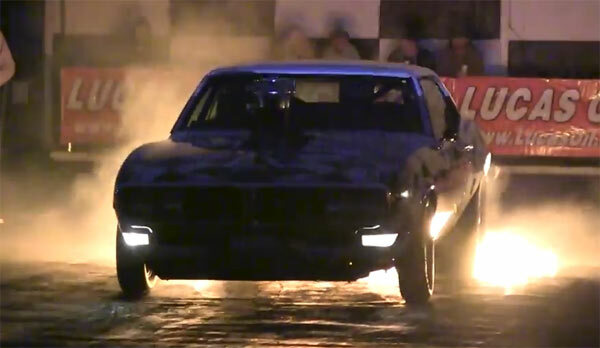 In this video Pete Lane cements the name from the race track at Shakespeare County Raceway in Stratford-upon-Avon, UK where muscle cars may not be as huge following as elsewhere in the world, but still have a dedicated following as shown in this video. The 1968 Pontiac here is running a 496ci. big block with a 8-71 supercharger and it’s anybody’s guess what tires are as they soon disappear after this run.